Buy Landgarten Organic Ginger in Dark Chocolate - 70g in the UK from our online shop or directly from our independent Scottish store. Fresh, rich and undeniably luxurious, Landgarten's Ginger in Dark Chocolate is the perfect contrast of long-lasting flavour and refreshingly enticing tang. Fresh, rich and undeniably luxurious, Landgarten's Ginger in Dark Chocolate is the perfect contrast of long-lasting flavour and refreshingly enticing tang. Vegan friendly, this sumptuous treat is the resulting combination of organically grown fruits, fair trade chocolate and the very best in gluten free ingredients. Send your taste buds into a frenzy and experience the best in healthy snacking, with Landgarten's Ginger in Dark Chocolate. We sell real Landgarten and other Chocolate directly from our shop in Scotland and online throughout the UK. View more products from Landgarten. Where can you buy real Ginger in Dark Chocolate safely online? If you are wondering where you can buy Landgarten Organic Ginger in Dark Chocolate - 70g safely online in the UK, then shop with us. We are an actual health foods shop; with real people selling real foods and products. Our award-winning independent shop is located in Stirling, Scotland since 1976. You can buy our Chocolate in store or safely place an order with us online or over the phone. 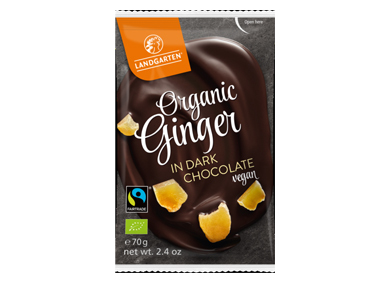 Ginger in Dark Chocolate - Landgarten Organic Ginger in Dark Chocolate - 70g in Chocolate and Confectionery.